As an art history student in the « Paris Sorbonne » and in « l'École du Louvre », I took the habit of spending my free time in the parisian auction house « Drouot ». 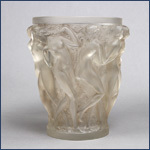 Compared with the traditional styles, « the Art Nouveau Period » was outstanding and especially , the works of Rene Lalique. The originality and modernity of his production made him look different from Gallé, Daum or Argy Rousseau. My deep interest in his creations has remained as vivid as it was thirty years ago. Exceptional jeweler of the « Art Nouveau Period », Rene Lalique is one of the major stars of the « Paris 1900 Universal exhibition ». Sarah Bernard, his friend and customer wears his jewels on stage in the play « Théodora ». His sponsor, Calouste Gulbenkian orders the highest quality exhibition pieces, in 1899 « the tête de Coq diadem » and the « Colombes » cire perdue vase in 1914. His collections are on show in the Gulbenkian museum in Lisbonne. In 1908, to fullfill the perfume maker Coty's commands, Lalique will rent the glass factory of Comb-La-Ville. For a larger industrial production, he will open in 1920 a factory in Wingen sur Moder. In tribute to Lalique, the city opened a museum in 2011. Rene Lalique's gifts of observation and his sense of perfect proportions will give him an outstanding place amongst the other artists of his time. His artistic intuition will lead him naturally from the « Art Nouveau » style to the « Art Deco » style. His representational designs will be as successfull as his abstract designs. For example the « Bacchantes » vase made in 1927.(ref. Christie's London cat. May 31, 2012 p. 28). 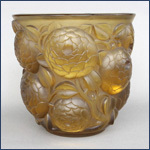 The use of arsenic embellishes the glass with an opalescent tint as for the boxe « Rose »made in 1921. (ref the « The Opalescence » by P. Decelle 1988). Lalique will use« patinas » to bring the designs alive . 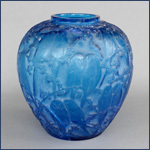 The vase « Sauterelles » made in 1913 receives a double patina, lime green on the criquets and deep blue on the body. (ref. Sotheby's Paris ,16 Feb. 2013). The inclusion of metal oxides enrichis the glass with bright colors. 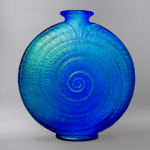 The « Escargot » vase made in 1920, (ref. Bonhams London 19 Nov. 2014) will exist in blue electrique, in ruby red, in amber, in yellow as in orange colored glass. Other examples of colored vases are the « Poisson » vase made in 1921. (ref. Christie's London , 31 May 2013). 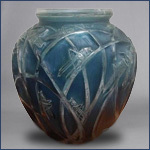 The « Perruches » vase made in 1919. 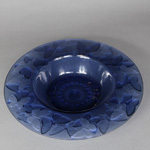 Here in blue electric glass from the S.W collection. The « Ronce » vase made in 1921. 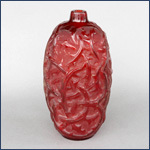 Here in red glass from the S.W collection. The Oran vase in yellow, made in 1927, from the S.W collection. 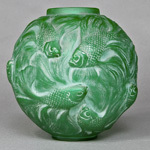 Rene Lalique's daughter Suzanne, who will later become a famous set decorator, often contributed to Lalique's creations. She has notably introduced the use of black and brown enamel on abstract themes, as with the « Lagamar » vase made in 1926. (ref. Ader Paris sale , 8 December 2013). 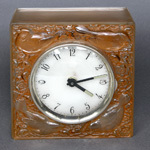 The diversity of Rene Lalique's inspirations and the exceptional care brought to the hand finish of the industrial glass productions confer him a unique position amongst the « Art Deco » glass company's such as Daum, Le Verre Français, Sabino, Etling, Hunnebelle and others. 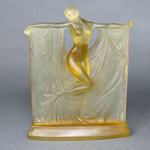 After his death in 1945, his son Marc Lalique takes the lead of the company and introduces his own style, see the « Lamp Danseuses » and the picture frame « Catherine ». In time, the use of glass will be abandoned in favor of cristal and designs will be simplified and modernized. Still, the Lalique company will remain an absolute reference in terms of style and quality.